What is whole wheat flour? Whole wheat literally means that the whole grain is used when grinding wheat to make flour. This includes the wheat germ and the bran. The wheat germ is the tiny, nutrition-packed part of each wheat grain that actually allows the seed to germinate and grow. According to the Mayo clinic, the germ is packed with valuable nutrients including thiamin, potassium, magnesium, vitamin E, riboflavin, phosphorus, iron and zinc. Wheat bran is the thin shell of each grain of wheat. It is a valuable source of fiber. Hi friends! 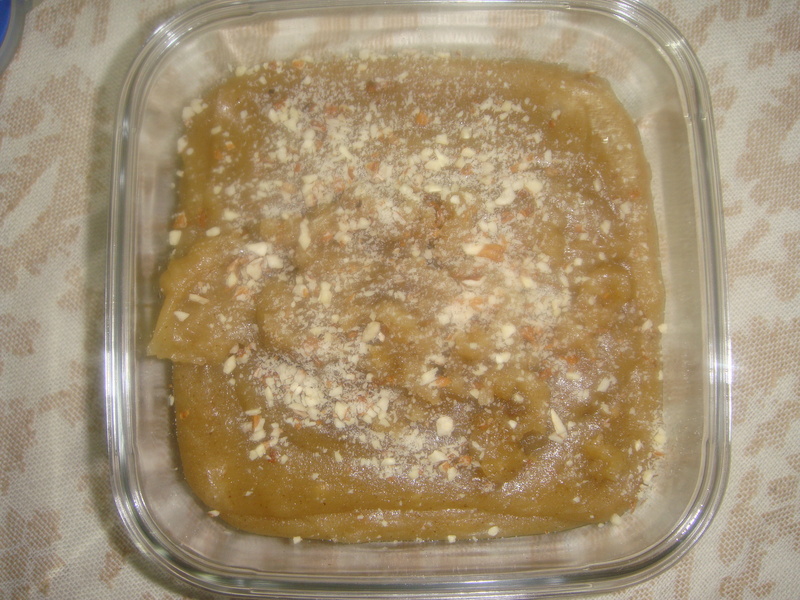 whenever you feel like eating something sweet and nutritious at home wheat Flour Halwa can be made instantly. So here is the recipe of Wheat Flour Halwa for you. In a wok/ Kadahi, melt the ghee add the wheat flour and stir fry over medium heat, stir it continually for about 8-10 minutes. When the flour is light golden in colour and does not stick together much , it is well fried . As the flour is getting fried, take water in a pan add the sugar bring it to boil, simmer it till required. Pour the hot sugar solution into the fried flour gently and carefully, stirring continually. Add half of the almonds and bring to a boil, stir continuously. Once the water is added to the flour mixture, stir well so that no lumps are formed. Flour absorbs the water added. Thoroughly mix let whole mixture, cook for 5-6 minutes more. keep on stirring so that the wheat flour halwa does not stick to the wok / Kadahi and starts leaving the sides. Wheat flour halwa is ready now. Serve hot, garnished with the almonds. According to your preference you can serve with Puris too.